If you have been reading my posts for a while now you would now know that I suffer from oily skin. It is not a pleasant skin type to have, as by the end of the day your make up has slicked of your face, and also I constantly feel like my pores a clogged up. Today I'm going to share with you some of my tips and tricks on how to keep your makeup in place all day, and reduce that greasy sheen to the skin. 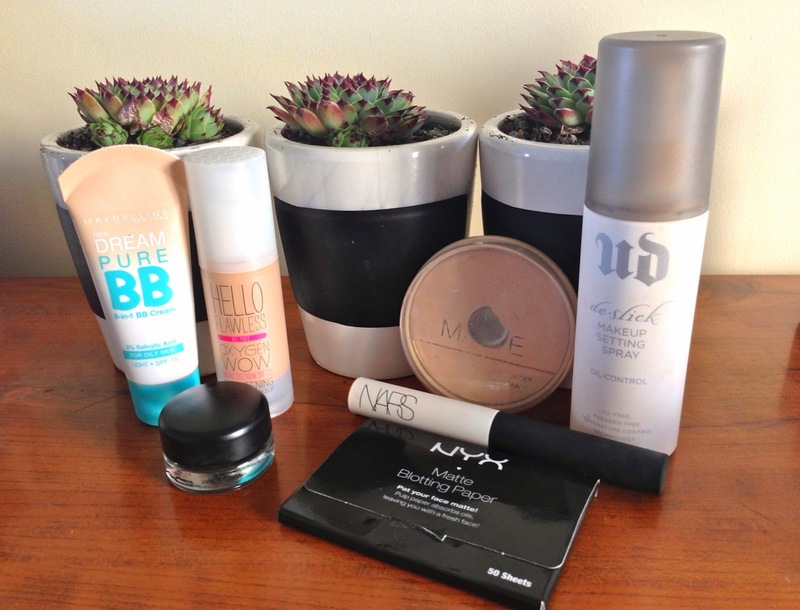 My first tip is make sure you are using a Oily free foundation or BB cream for everyday. When applying a base to your skin you are not going to want to be adding more oil into the mix. This will only make things worse. A foundation I love is the Benefit Hello Flawless Oxygen Wow foundation. It gives great coverage and doesn't leave your skin felling greaser than it already did. 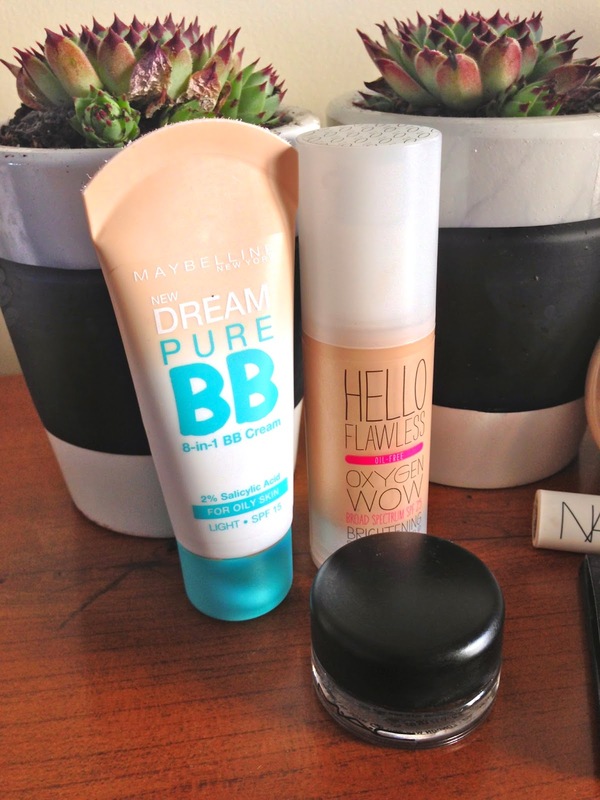 A BB Cream favourite of mine is the Mayballine Dream Pure in the Oily Skin formula it contains Salicylic Acid which helps penetrate blocked pores and helps with the prevention of pimples. After our foundation is on we want to set it with a powder that will help prevent greasiness on the skins service. My all time favourite and top recommendation is the Rimmel Stay Matte powder. It works wonders. I have it in my purse throughout the day, when I am in need of any tough ups I just pop it out and it makes the shine disappear instantly. Makeup setting spray is also a good added extra to your routine to stop your makeup moving around throughout the day. 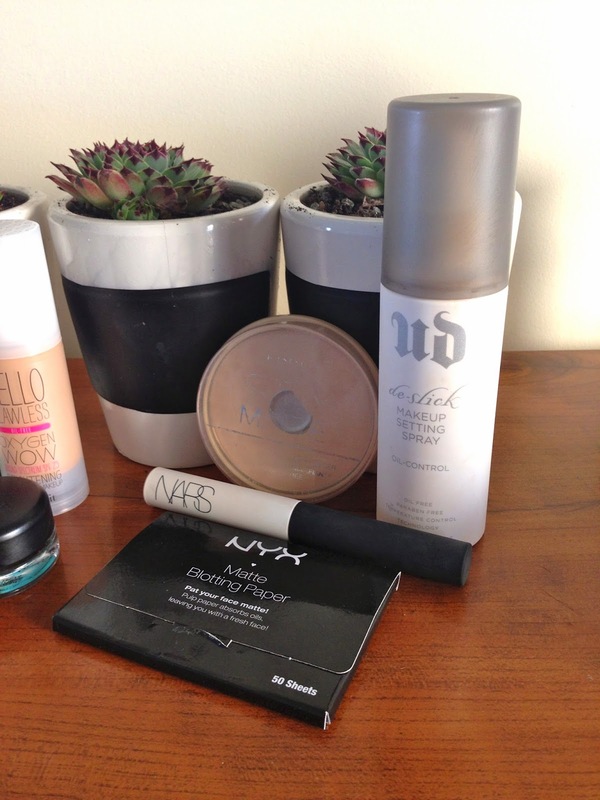 My favourite is the Urban Decay De-Slick setting spray. Spray this on when your are finished applying your make up and your set. It will help keep your makeup staying put while the day goes on. Not only do we need to prep our face but we also need to prep our eyes, to avoid our eyeshadow moving around and coming off. A great eye primer is the NARS one. I use this when I need to make sure my eyeshadow stays put throughout the day. Another great tip is using a coloured cream eyeshadow to prime your eyes. Here I have a MAC paint pot. Cream eyeshadow works well as the powder eyeshadows adhere to it. If you find yourself getting a bit greasy looking mid way through the day. Blotting papers are a great thing to have in your purse. Whip one of these guys out of the packet and start to blot your face. They absorb all the excess oils off your face.